It’s that time of year again, the beginning of autumn when the bounty of summer comes in. And like so many of us who grow our own food, I’m feeling a bit inundated at the moment! So far, I swapped some of my egg glut for a bag of crabapples and elderberries for jelly making; pickled and dried nectarines off our tree; dug and bagged potatoes (and I’ve still got more in the ground); eaten and dried so many beans; vainly tried to stem the attack of the killer zucchinis; dried enough prunes for the coming year but still the kitchen looks like it’s overflowing with plums now I’ve finally got the last of the fruit off. Some of you might recall I talked about some volunteer Roma tomatoes that survived winter in the worm farm and germinated in November. Well, quite a lot of them came up in one of the wicking barrels! I thinned the plants out and over the last month picked about 4 kg (just shy of 9 lb!) of perfectly delicious tomatoes. Summer has been a very mixed bag here in Tasmania with much cooler temperatures and more rain than usual, and it seems we’re getting more balmy weather now that we’re officially into autumn. Everyone’s been complaining that tomatoes are slow to fruit, smaller than average and so on, but I think the flavour has been outstanding! 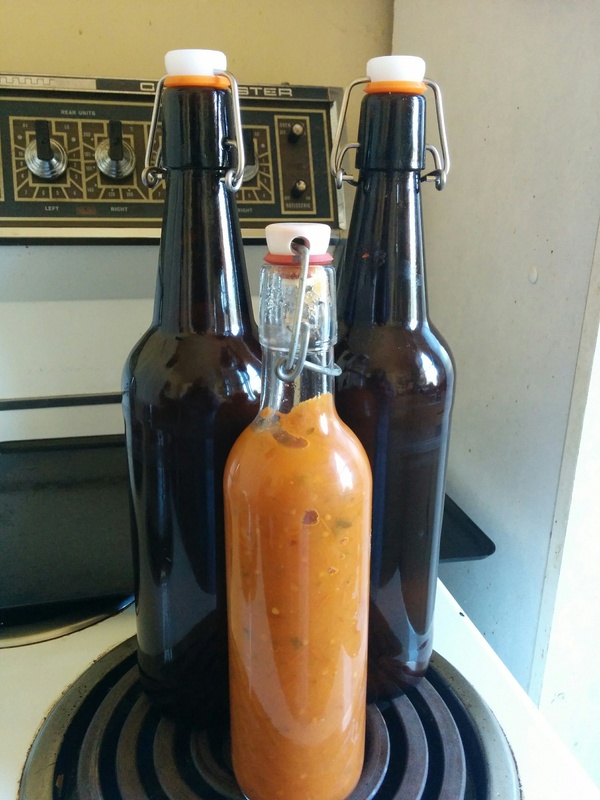 I don’t normally grow a lot of tomatoes but I decided to go for it this summer so I could bottle fruit as it ripens for use in winter stews and curries. This is reflected in the varieties I chose – Principe Borghese, San Marzano, Polish Giant and Debarao. These are all in various stages (the Debarao are still flowering) but I did bottle the first kilo of San Marzano this week and they are fabulous! I didn’t factor in for the Roma crop (it was quite a surprise!) and that’s come in earlier than the rest. So I decided to make that wonderful Italian pantry staple, Passata. It’s kind of like making your own pasta sauce, totally to your taste and giving your winter meals a touch of those sun-kissed summer days. Wash the tomatoes, remove any stems, bruises, etc. Put them in a large stockpot with the oil, garlic cloves, honey, onion, wine and chopped chilies. Heat slowly over a low heat until the tomatoes start to sweat and mash down. Stir occasionally but leave the lid on as much as possible. 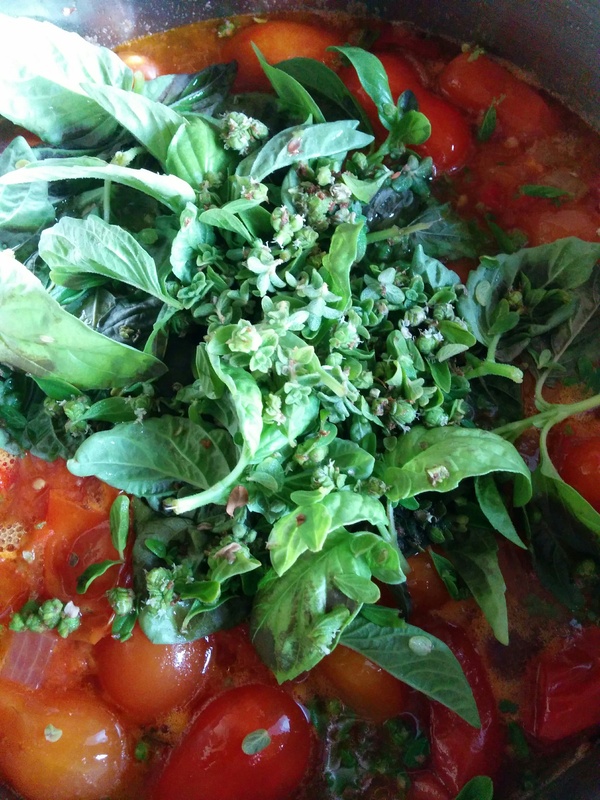 Add the fresh herbs and continue cooking until it starts to look like a tomato soup. Season it to taste. Take off the heat, cover and leave overnight. 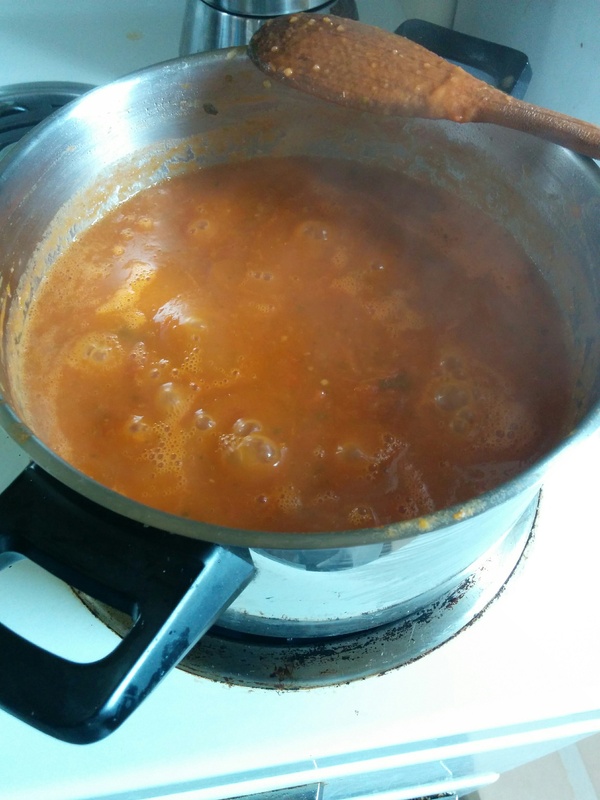 The next day, put the cold tomato mix through a blender and pulse to the desired consistency. Clean and sterilise jars/bottles and lids/tops. Put the blended mixture back into the stockpot and reheat. Boil gently for at least two minutes. Take off the heat and prepare a tall stockpot for a water bath (or Fowlers Vacola or Ball canning/bottling vat). Ladle the hot Passata into sterilised jars, add ¼ or ½ tsp of citric acid to each jar, cover securely with sterilised lids and place in water bath. Bring the water up to the boil and hold for 20 minutes with the lid on. Turn off the heat and leave the jars to continue processing for another 15 -20 minutes. Remove the jars carefully (they will be very hot) and put them on a board to cool. Check for a seal, label and store in a cool place. This will last unopened for up to a year but mine never lasts that long! This recipe made just over 2 liters and can be bottled in smaller jars as well – I just have lots of swing top bottles this year! Take care and talk with you all soon, I have to go make Plum Butter now………..
Hi Debra. Cheers for the spicy passata recipe. We might get enough tomatoes if this run of warmer weather keeps up but as we only got our wicking beds up and running at the end of November (and planted out early December) the odds are a bit stacked against us. We are back at TAFE studying screen and media and I see that our lecturer is a mutual Facebook friend of yours. Small world eh? Lovely to hear from you! The Bureau of Met. seem to think the warmer weather will last for at least March – which will suit me fine! I hope you get a crop, but well done for getting all your wicking beds up and running!